The 1980s were a period of transformation for Star Wars. Following the release of Return of the Jedi and L. Neil Smith’s Lando Calrissian trilogy, there were few new tales being offered, aside from Jo Duffy’s Marvel Comics run and West End Games’ role-playing game books. Although it may be difficult for newer fans to fathom this, given the huge amount of Star Wars material being produced these days, the mid to late ’80s were lean years for the franchise. It was during this period that Star Wars began focusing on stories for a younger audience. Jedi‘s resident teddy bears branched off into two TV movies, Caravan of Courage: An Ewok Adventure and Ewoks: The Battle for Endor. 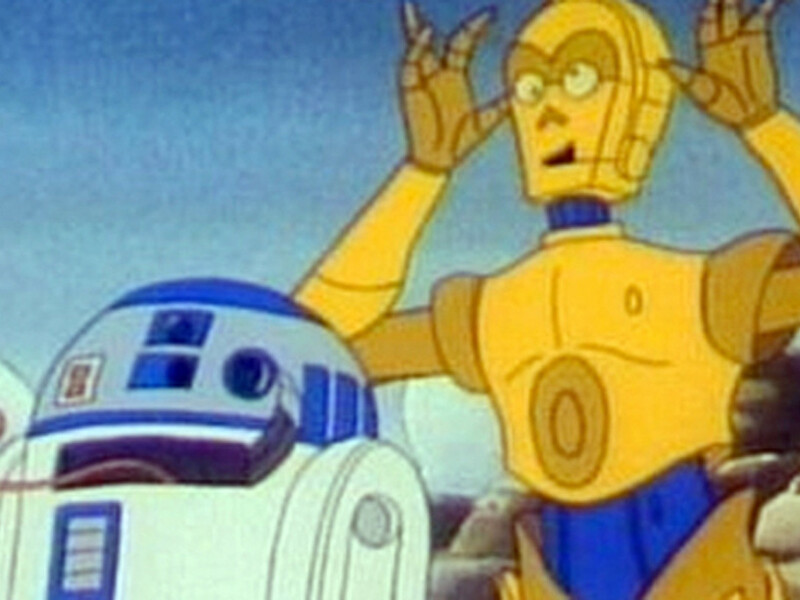 Simultaneously, Lucasfilm developed two animated series, one featuring R2-D2 and C-3PO, the other Wicket and his Ewok playmates. Star Wars: Droids and Star Wars: Ewoks (later re-named The All-New Ewoks) aired in an hour-long block dubbed The Ewoks and Droids Adventure Hour, each spinning off a variety of children’s storybooks, as well as a corresponding comic book series from Marvel’s Star Comics imprint. 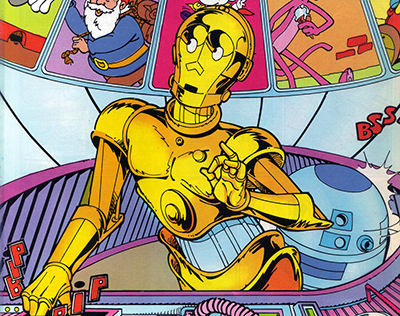 In addition, a 48-minute special called The Great Heep aired in 1986, several months after Droids‘ cancellation, and Dark Horse rejuvenated the Droids concept with new stories eight years later. 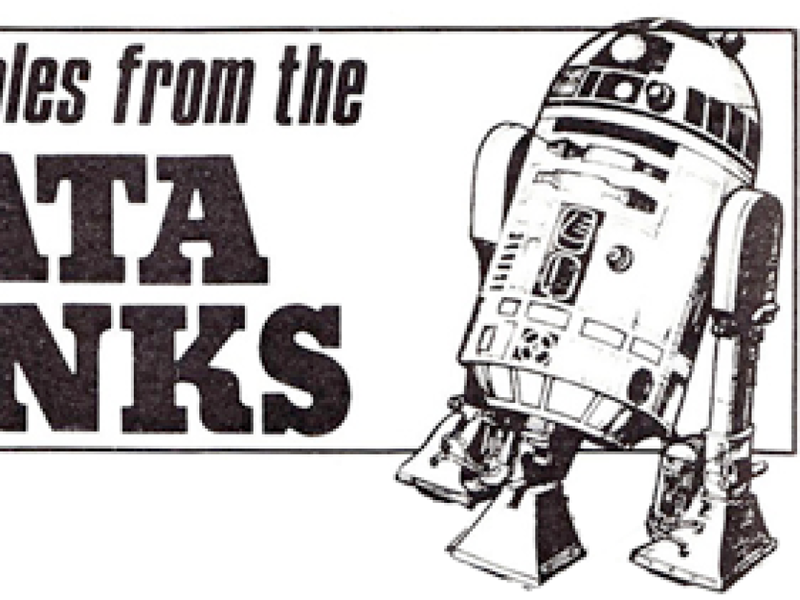 What few fans may realize, however, is that Marvel and Dark Horse were not the only publishers to offer Droids or Ewoks comics. 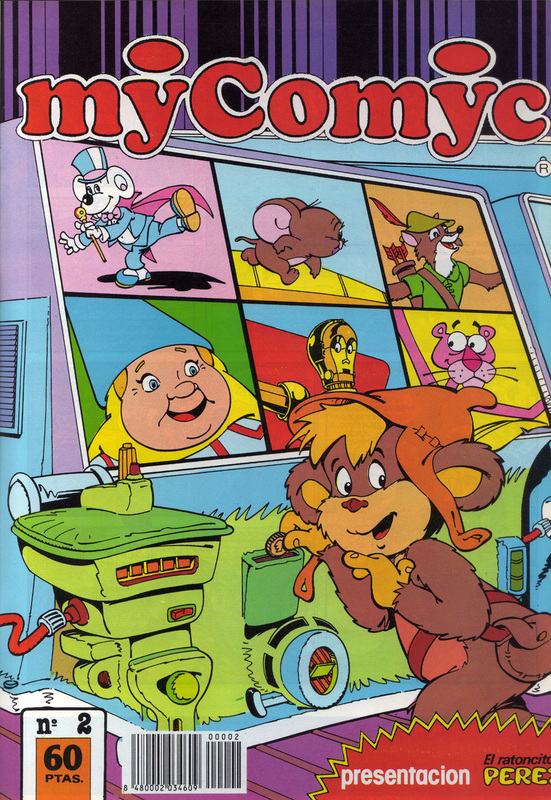 In 1986, Spanish publisher Editorial Gepsa produced an anthology comic series titled MyComyc that ran for 16 issues, featuring two pages each based on several popular cartoons at the time, including Tom and Jerry, The Pink Panther, Inspector Gadget, and David the Gnome. 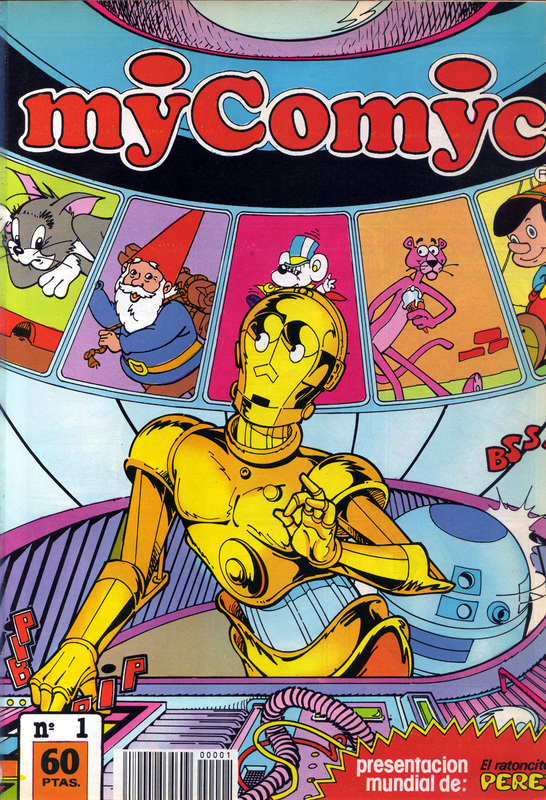 Among MyComyc’s lineup for the first eight issues were strips based on the Droids and Ewoks TV series ­ new material, not reprints of Marvel’s work. 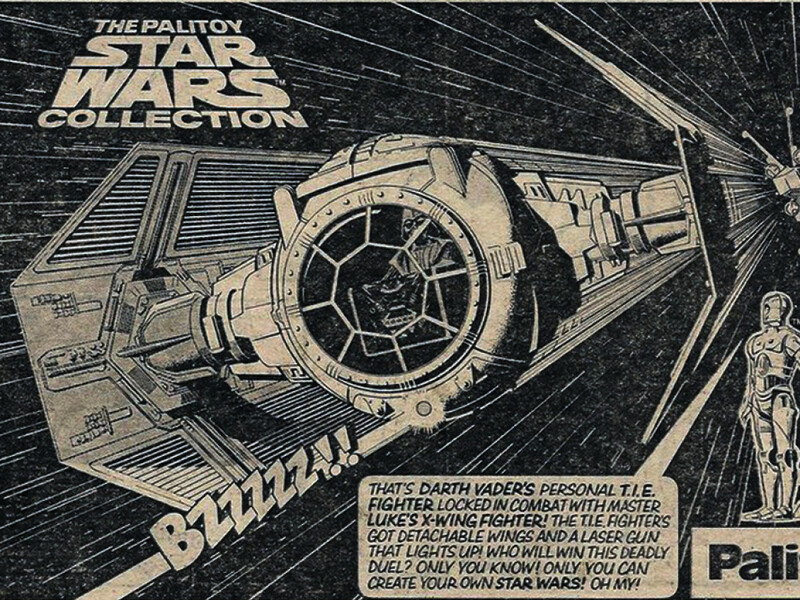 The writers of these strips are unknown, but the artwork was provided by studio Beaumont C. de B., which also illustrated a number of Spanish Droids and Ewoks pop-up books for Editorial Roma at the time. 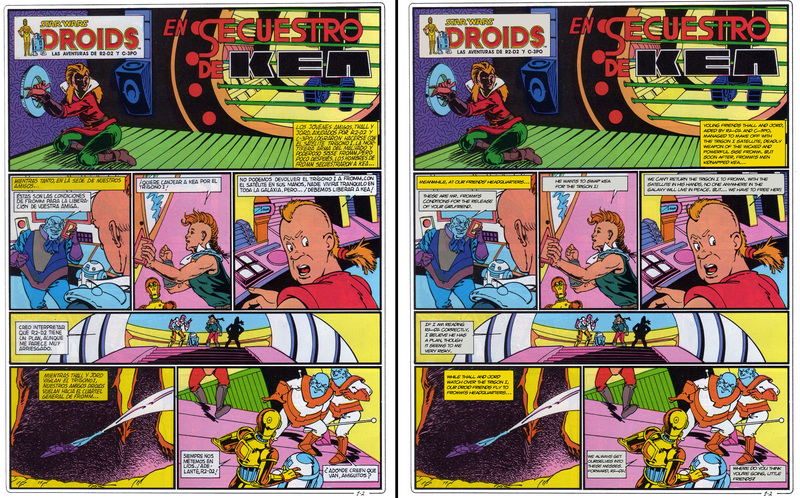 The comics’ indices indicate that the series was edited by Lourdes Ribes, printed by L. Roses S.A., and distributed by a company called Midesa, with publicity and promotion provided by Mercantil Cuatro S.A.
Droids strips appeared in the first seven issues, while Ewoks ran in all eight, for a total of 30 pages of new material: 14 and 16 pages, respectively. 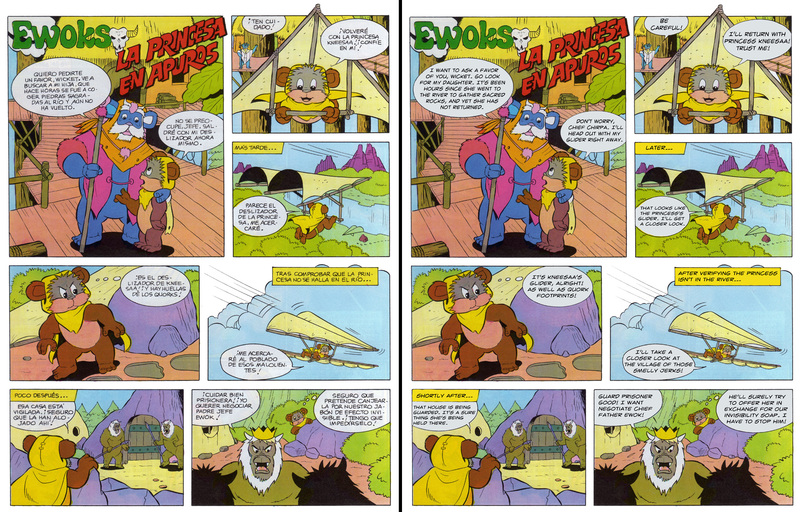 (This continued a trend, incidentally, as the Ewoks animated series outlasted the Droids cartoon, and Marvel’s Ewoks comic outlasted its Droids line, so it’s only fitting that MyComyc‘s Ewoks strip would outlast its Droids tales by one issue.) 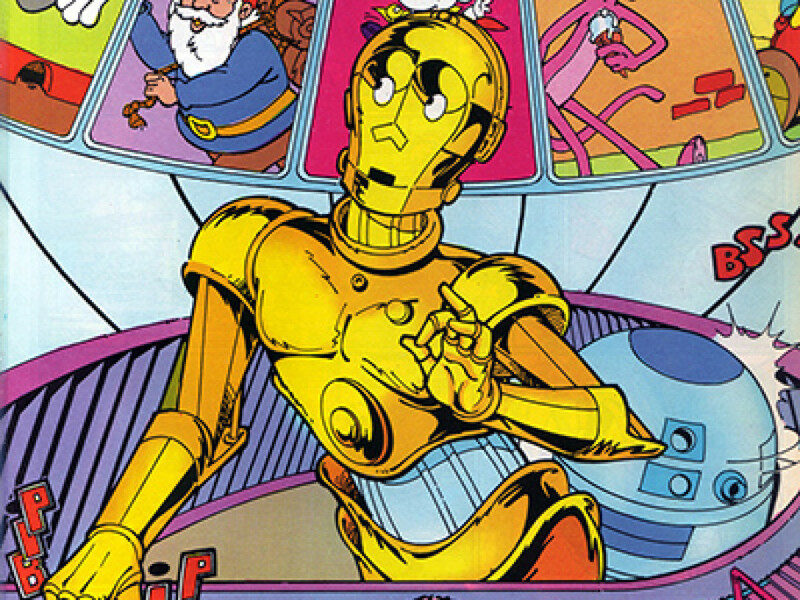 Threepio and Artoo were featured on one of the eight covers, while Teebo the Ewok graced another. 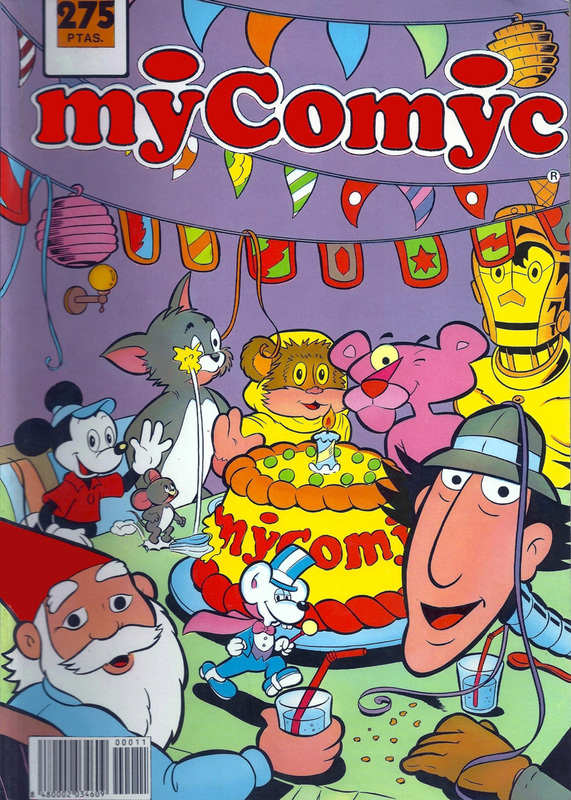 A reprint edition, published in 1987, collected all eight MyComyc issues in a single volume, with Wicket and the Droids sharing a birthday cake with other animated characters, prophetically including Mickey Mouse. Still, despite such silliness on the writing front, the MyComyc strips were quite well-drawn, capturing the tone and aesthetic of the two animated series remarkably well, particularly in the case of the Ewoks. What’s more, the writers clearly knew their source material, incorporating Jann Tosh, Jord Dusat, Kea Moll, the Fromm Gang, Vlix, Roon, Annoo, and the Trigon One into Droids, while working Teebo, Kneesaa, Chirpa, Logray, Paploo, Latara, Morag, the mantigrue, Gorneesh, and even the Quorks (from Marvel’s issue #3) into Ewoks. The series did have a few continuity issues along the way, such as Droids‘ Koong being drawn as a green-skinned, reptilian with pointed ears and a huge, jagged-toothed mouth. However, since he was called General Koong and not Governor Koong (a human villain from the TV series), this can be reconciled by assuming them to be different characters. In addition, adjectives used to describe Morag in Spanish incorrectly implied she was male, and Jann Tosh looked nothing like he did on television. What’s more, the inclusion of an alligator in Ewoks and a man named Smith in Droids were uncharacteristically terrestrial. Otherwise, the stories admirably captured the essence of the Star Wars cartoons. An episode guide appears below. In retaliation, the Fromms kidnap Kea Moll, and Vlix Oncard delivers an offer to the racers: the satellite for their Rebel friend. Jord and Thall send the droids to the Fromm headquarters, where Artoo temporarily blinds everyone with a bright light, enabling the mechanicals to rescue Kea. After R2 repairs Thall’s hot rod at a Roon garage, Vlix steals the vehicle from its berth so he can pilfer a “cosmic treasure” from its guardians and blame it on the droids. With help from a worker named Nik, Artoo remotely takes control of the vessel and orders it to return Vlix to Roon. Note: The treasure’s nature is not indicated. After acquiring the droids, Jann Tosh brings them to Roon’s communication satellite to visit his friend, Professor Smith. But the academic’s droid, XR — reprogrammed and armed by General Koong — captures them upon arrival. Artoo outwits the sabotaged droid and rescues the others. While Jann Tosh goes shopping, C-3PO falls through a trapdoor into the laboratory of Professor Broom, an evil scientist who captures droids, removes their memory diskettes and turns them into scrap. As Jann and R2 storm the lab, Threepio knocks Broom unconscious with a piece of metal. The droids visit Kea on Annoo, followed by the Fromm Gang, who want Kea’s secret plans for a nuclear-powered missile. 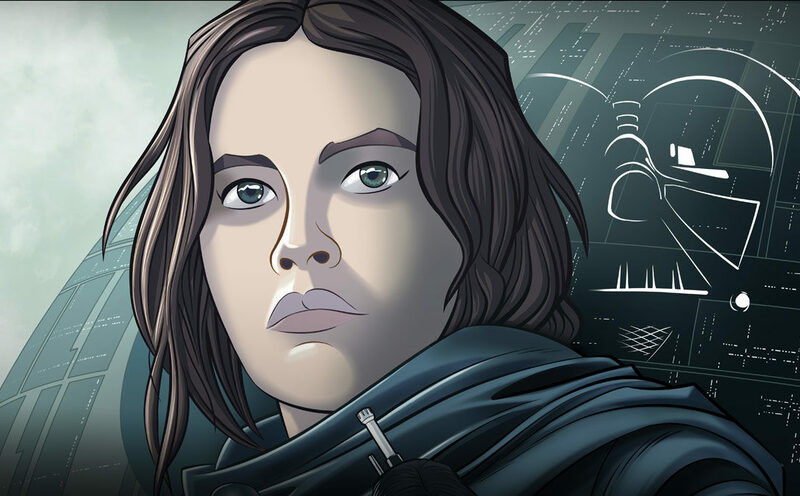 Kea is forced to land at Tig’s fortress, where Artoo downloads and wipes the disk’s contents. Unaware of this, Tig lets them go free in exchange for the useless disk. As Artoo and Threepio search for new adventures, an artificial cloud envelops their ship, and ghost-like beings suddenly appear and then vanish. They find Tig’s satellite, which the gangster is using to abduct space travelers. The droids board the satellite, deactivate the cloud apparatus and escape. Note: The phantoms’ presence is not explained. The Ewok village celebrates Kneesaa’s birthday with a grand party, and Chief Chirpa asks for Wicket’s help in picking berries. The Duloks plot to trap the Ewoks as they harvest, but Wicket notices the unwashed Duloks’ body insects, and Paploo chases them away with his horn. The Tulgah witch Morag and her mantigrue servant unleash a potion to poison the Ewoks’ berry bushes so they’ll die of hunger. Logray gives Wicket and Teebo an antidote to disinfect and protect the fruit, and Wicket thanks the elder with some jars of jam. When Kneesaa vanishes while collecting sacred rocks, Chirpa dispatches Wicket, who discovers her glider. He follows Quork footprints and learns that the thugs have captured the princess as ransom for the Ewoks’ invisibility soap. Wicket rescues Kneesaa and earns a medal for bravery. Chirpa sends Wicket and Teebo to cut down some trees and fetch their sacred wood, but as the youths carry back their haul, they fall into a Dulok-dug hole. As a Dulok guard runs to inform King Gorneesh, the Ewoks use the wood to build a ladder and climb to safety. While testing a new hang glider, Wicket passes Explorer’s Crag, where he discovers a hot-air balloon containing a corpse. With Logray’s help, Wicket and Teebo re-inflate the balloon and buzz the Dulok village, mocking Gorneesh and his goons as they fail to bring the Ewoks down. NOTE: The corpse’s identity is not revealed. While playing her flute, Latara becomes lost near Dulok territory, and the Duloks start an avalanche to trap her within a cave. Chirpa sends Paploo, Wicket and Teebo to find her, using a flute from Logray that can pick up vibrations from Latara’s instrument. Two Duloks sneak into the Ewok village and steal Logray’s magic staff for Gorneesh, who uses it to make himself extra smelly and scare swamp creatures. Logray confronts the king, utilizing his magic to take control of the staff. Terrified, Gorneesh returns the stick and runs away. After the Ewok children paint a cave for the Youth Pictorial Exposition, Morag uses a potion to destroy their artwork, gleeful about being evil. Logray magically restores their drawings by calling upon the Gods of Color, and the Ewoks spread glue to trap Morag when she returns to try again. The MyComyc strips received limited distribution in Spain and are thus difficult to come by. Since they were never published in English, in fact, few fans outside of that country even knew of their existence until December 2012, when Spanish fan Adolfo Rodriguez posted a note at the Dark Horse Comics forum, bringing the strips to others’ attention and offering to scan them in case Dark Horse was interested in reprinting and translating them. 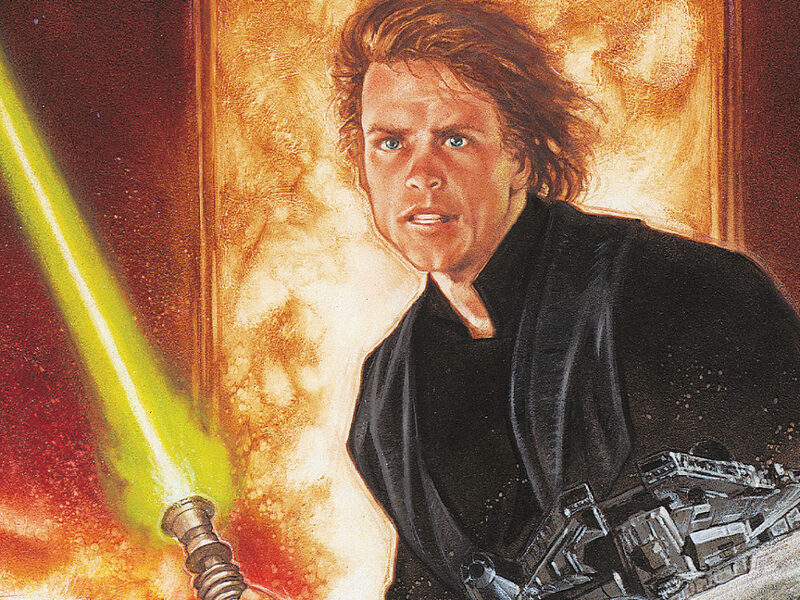 With help from Star Wars: The Essential Atlas contributor Eddie van der Heijden, Rodriguez provided scans of the eight issues to Dark Horse, as well as to me and a few others, in the hope of convincing the publisher to reprint them. Intrigued, Stradley looked into the possibility of collecting the strips in a future omnibus, inquiring at Lucasfilm about whether they had been officially licensed. Unfortunately, despite the comics bearing appropriate copyright information, Lucasfilm was unable to locate paperwork proving Editorial Gepsa had actually licensed the titles. The other strips in the anthology also bore their respective copyright disclaimers, so it may be that MyComyc was legitimate — or it may have been produced illegally, with fake disclaimers to throw people off the scent (a common practice in some non-English comics markets). It should be noted, though, that the strips have an air of authenticity to them, uncommon among bootlegs. Although it’s true that a great many franchise-based comics have been produced without permission first being obtained from copyright holders, in Spanish as well as in other languages, many such works are inferior rush jobs intended to make a quick buck without regard for quality. That’s not the case with the MyComyc strips, which look and read remarkably like their television counterparts. If these were produced illegally, then Editorial Gepsa took an unusual amount of care to make the strips fit well with the cartoons, and even with their Marvel spinoffs. Another strong piece of evidence that the strips were, in fact, licensed, is that Beaumont C. de B. also provided the artwork for a series of Dinosaucers books published by Grijalbo Mondadori, a Spanish-Italian publisher that later merged with Random House. Dinosaucers was a television co-production between US company DIC Entertainment and Canadian firm Nelvana — the same company that created the animated segment for The Star Wars Holiday Special… as well as the Droids and Ewoks cartoons. It seems rather unlikely that Nelvana would have a professional relationship with Beaumont regarding one of its properties if the art studio were also producing unlicensed comics based on its other properties. Despite this strong link between Nelvana and MyComyc, as well as the fact that Beaumont also illustrated Droids and Ewoks books for Editorial Roma, the strips’ legitimacy is considered suspect for now, and Dark Horse has no plans to reprint them unless documentation emerges. In an effort to make the strips available to fans in the meantime, I worked with fellow Star Wars scribe Abel G. Peña (who also helped research this article) to translate the strips and re-letter them in English, after which Star Wars: Empire’s End contributor Mike Beidler produced PDFs of each series for easy download. It’s a shame that these strips are unlikely to receive an official reprinting any time soon, when they may very well be legitimate “forgotten” gems. But for now, Star Wars fans can at least read and enjoy them. ¡Que la Fuerza te acompañe! The translated strips are available for download at my web site, and at Abel’s site. Read Abel’s account of the translation process here. Eddie’s reflections on the project are posted here. Rich Handley is the editor and co-founder of Hasslein Books, the managing editor of RFID Journal, the author of three books (Timeline of the Planet of the Apes, Lexicon of the Planet of the Apes and The Back to the Future Lexicon) and a frequent writer for Bleeding Cool magazine. He has written numerous articles and short stories for starwars.com and the licensed Star Wars universe, and was a columnist and reporter for Star Trek Communicator magazine for several years.